Exfoliation is the double-edged-sword of most skincare regimes. Regular exfoliation supports cellular turnover by removing dead skin cells from the outer layers of the skin. It’s an essential part of skincare required to keep skin healthy and leave your complexion smooth and bright. But, exfoliate too much, or with the wrong products, and you’re likely to end up with irritated skin that’s red, blotchy and sensitive. While how, when, and why to exfoliate can cause confusion, don’t be tempted to miss this vital step to luminous skin. A build-up of dead cells can make skin appear dry, lifeless and dull. Once these cells have been removed, underneath are healthier cells which are fresher, brighter and will make your complexion glow. Breakouts and acne are caused by occlusion. This is when pores become blocked with excess oil, dirt, or dead skin cells. Exfoliating helps to remove these excess particles from your pores to minimise the risk of breakouts. Minimises the signs of aging. Applying makeup on top of dead skin cells can make it look clumpy and highlights fine lines and wrinkles. While exfoliating doesn’t directly counter-fight the signs of ageing, it certainly makes the visible effects easier to cover up. Pigmentation (or sunspots) is caused by over-exposure to the sun which can make skin look patchy and uneven. Regular exfoliation removes the cells that have had the most exposure to sun contributing to even skin tone. Proper exfoliation clears pores to help your serums penetrate the deeper layers of your skin. By the time those skin cells reach the surface, your products have been working for longer to create a stronger, healthier appearance. The confusion with exfoliation often comes because there is more than one way to exfoliate. Whether you choose ‘manual exfoliation’ or ‘enzyme exfoliation’ can make the difference between healthily removing dead cells or subjecting your skin to abrasive products that can do more harm than good. Manual exfoliation is the process of scrubbing skin with a harsh (often chemical-laden) product with a grainy consistency which physically takes the dead cells away from the skin’s surface. Unfortunately, most scrubs and formulas used in manual exfoliation can’t define between healthy and unhealthy cells, so they remove all those they can access, including the healthy ones. The problem with this is two-fold. Firstly, you’re removing cells that haven’t yet completed their natural cycle which can cause pain and sensitivity. Secondly, you then expose the cells underneath to the elements before they’re prepared risking long-term damage in the future. Enzyme exfoliants work differently in that instead of removing the cells from the skin’s outer layers, they break down the protein which creates the dead cells. Enzyme exfoliants don’t directly remove cells so they won’t harm your healthy skin cells in any way. While grainy scrubs may feel like they’re getting the job done, they’re actually quite abrasive and cause micro-tears in your skin. Enzyme exfoliators, on the other hand, are generally obtained from fruit or natural sources and gently dissolve dead skin cells. Because you can’t over-exfoliate with enzymes, there’s no risk of damaging the skin. Manual exfoliation with harsh products can leave skin sensitive, red and blotchy, and vulnerable to environmental factors which can cause long-term damage. We recommend regular enzyme exfoliation with daily use of our Bd serum. Rich in tartaric acid, the pure Davidson plum extract helps to naturally break down the protein bond that’s stopping your dead skin cells from dropping away. Your skin can then cleanse and clear away blackheads and control the oil flow which promotes healthy cell turnover. Enzyme exfoliation is gentle on even the most sensitive or acne-prone skin, and Bd serum promotes healthy skin care 100% naturally. Exfoliation is a pivotal step in your skincare routine, and if it’s previously left you with sore and sensitive skin, it no longer needs to be overlooked. Most products on the market contain activating ingredients of around 2%. 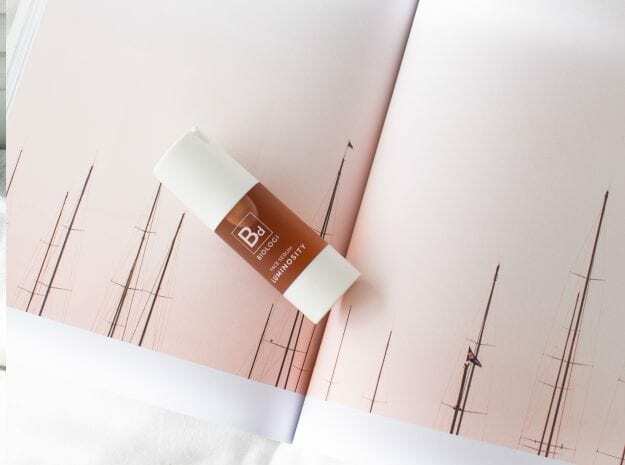 The whole range of Biologi products is 100% active and 100% natural giving you an enzyme exfoliator that hydrates skin and fights the signs of ageing, in one single product.